Chocoholics rejoice, it's National Chocolate Week; a legitimate excuse to celebrate chocolate for a whole seven days! From gooey brownies and rich puddings, to dusted truffles and tempting slabs, there are endless ways to enjoy one of the most indulgent treats. It’s the enduring love of chocolate that ensures that it is never off the Barbican Kitchen menu - currently we’re serving chocolate and almond torte with milk chocolate and caramel cream, and it’s an extremely popular choice. 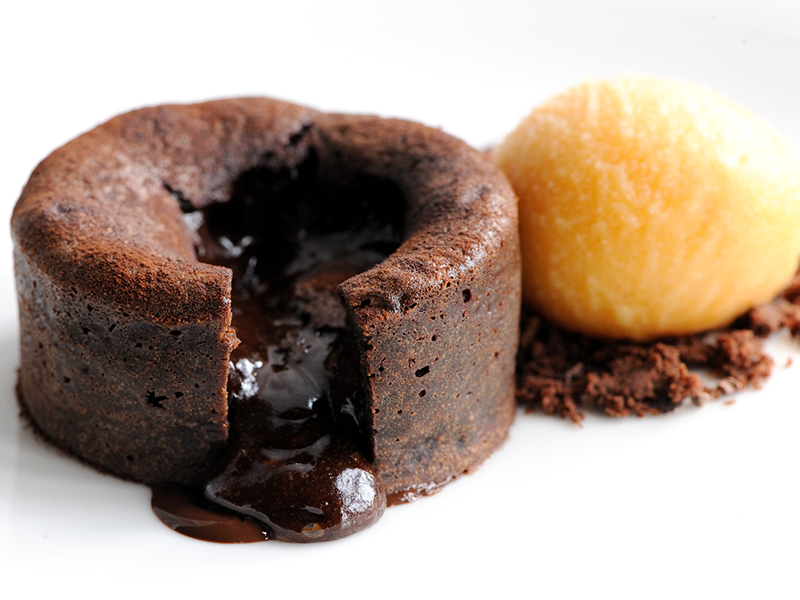 Melt the chocolate and butter in a heatproof bowl placed over a saucepan of simmering water. When melted, stir slightly then let to cool. Pre heat oven to 180oc and lightly butter and flour 6 x pudding basins in preparation. Whisk the eggs and sugar together until light and pale – then double in volume using an electric hand whisk. Next fold the egg mix into the cold chocolate. Sift in the flour and cocoa, folding it together. Spoon into the pudding basins and bake for 7 minutes until risen – keeping a close eye on them. Set aside on wire rack to cool slightly. Whip the cream with vanilla pods that you’ve cut and scraped the seeds from, until they reach soft peaks. To serve, turn out the fondants, dust with cocoa powder and add a dollop of whipped cream. Enjoy!